Apart from my whitewater background, I also have a racing/river marathon background, so it was important to me to create a model for the Vagabond line-up that has real speed. I also enjoy multiday trips, anything from two days to two weeks at a time, so I wanted a sit-on-top that also doubles as a touring kayak. And thus, the Marimba was born. The Marimba hull is designed along the same principles as the Kasai and Tarka, but I made it narrower and longer. It still boasts superior stability and it is certainly not an experts-only design. It has really good glide, and it tracks very well even without a rudder. It has no trouble turning using paddle strokes. Unless you intend to surf ocean swells, it is not really necessary to install a rudder. I added a lot of volume in the bow and stern. I wanted the boat to handle big volume rapids with ease, as I will be using the boat for some river trips. The volume is also helpful when punching through ocean waves, and it certainly helps the boat to handle extra weight when loaded for a multi-day expedition. The deck is typical of all Vagabond’s sit-on-tops. It has a really comfortable Seat and the feet are positioned lower than the bum, making it easy to sit in it for hours. The Paddle Cutaways on the deck, combined with the narrower hull, results in a very natural paddling stroke. If you are a racing paddler used to a wing paddle, this is a rec kayak that absolutely allows proper wing paddling technique. I added a Day Hatch between the seat and footwell for things like snacks and a camera; smaller items that are handy when doing longer trips. There are also two more Hatches, one in the bow and one behind the seat, that allow access to huge in-hull compartments for serious multi-day trips. There is also a large Tankwell in the stern for quick-access storage of dry bags and gear. I’ve put the Bottle Holder behind the seat, in the middle of a larger recess that can be used for hydration bladders of up to three litres in volume. I positioned the very handy Paddle Rest next to the cockpit. To top it off I’ve put some convenient Bungee Cords on the bow for extra storage of quick-access items. As I did with most of our sit-on-tops, I added two handles on each side, which is really helpful when handling the boat off the water on your own, and also for safety on the water when taking a swim. Of all the sit-on-tops in our line-up, this is certainly the boat that I will use the most. 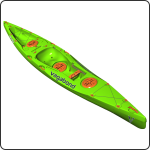 I’ll use it for flatwater training on our local section of river, and I will be using it for some extended trips on the Orange and other rivers around South Africa. If you, like me, enjoy speed and longer trips, this is the boat for you.